‘This is Heaven on Earth’: Week 1 of summer camps a success! Not only was this our first time offering these camps, these were the first camps ever offered here at the World of Speed! Each day featured numerous activities meant to inspire, teach and entertain 3rd-5th grade students. The week started out with an assortment of scavenger hunts and tours of the showroom floor. Each day both programs drove laps in the driving simulators, on the 1:24th scale slot car track and on an electric RC car slalom course. It all added up to a head- to head challenge to see what program learned the most about racing. Fun and Games at World of Speed: Focused purely on entertainment and fun. This program highlighted team building exercises, lessons in creating strategy, and following instructions. Most mornings started with a large group game, often in the kickball or of the running variety with everyone involved. These students would then go off as a group to test the NASCAR, IndyCar and Formula1 driving simulators. Though many of these young pilots needed aid in reaching the pedals, their lap times reached record breaking speeds. Next they moved on to an RC slalom course set up in the back parking lot and learned how to steer and navigate a fast car on a tight course. The students would then test their endurance driving abilities on the speedy quick slot car track. Without the limiters, these zippy racers fly around the short course. The first day with this group was a little rough, lots of spinning and crashing off the track but with a lot of practice even the most unstable of cars could make it around the course safely. “The slot cars are awesome! They are my favorite!” remarked 8 year old Christian. 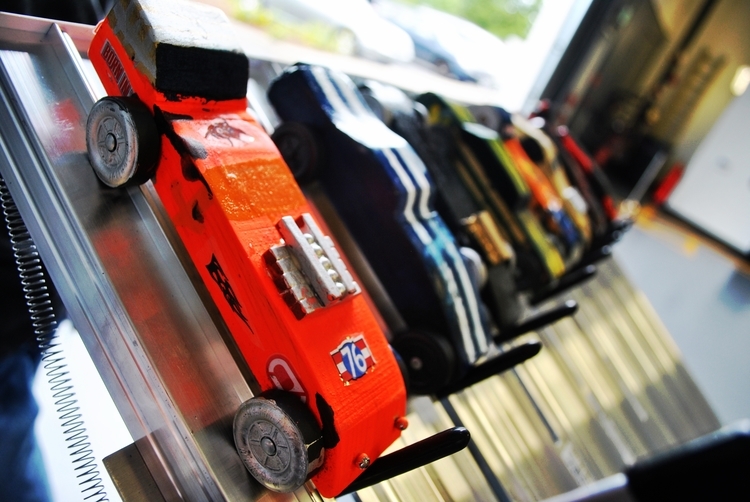 The Design, Build, Race program focused their energy on the fun element in building their very own Pinewood Derby cars. They also tested our driving simulators, played group games and raced. Their main focus was the building competition at the end of the week to race on the pinewood track. Each student started with a block of wood, studied the shapes of cars using the showroom gallery and carved out their pinewood skeletons. Then they sanded and smoothed the surface of their cars to mold the exact shape to their liking and prepped them for painting. Once the colors, numbers and stripes were applied, came the most anticipated step: naming the cars! Please Scroll through our gallery of week 1!